Sleep apnea is a condition characterized by repeated pauses in breathing that last at least 10 seconds, and may last as long as 90 seconds, throughout the sleep cycle. It is a fairly common condition that affects approximately 18 million adults. While many of the health-related concerns associated with sleep apnea are well-documented and well-understood, it is only in the last few years that researchers have started to thoroughly examine the negative effects sleep apnea can have on memory loss and the early onset of dementias. It has long been understood that sleep plays a role in memory formation and consolidation, and that older adults may be particularly susceptible to memory complaints due to loss of sleep. However, it is only recently that researchers have actively examined the role of sleep disruption on specific memory disorders including Alzheimer's and other dementias. This early study, conducted by medical professionals at several California universities, sought to determine the relationship between Sleep-Disordered Breathing (SDB) and cognitive deficits, as well as the mechanisms that may underlie this hypothesized phenomenon. Over a two-year period, this study examined a total of 298 women with a mean age of 82.3 years, 193 who did not have a history of SDB and 105 who did. They found that the women with SDB were more likely to develop cognitive deficits. This review of the existing literature was conducted under the guidance of professionals at the University of Western Australia. They examined 33 reviews that evaluated studies examining the effects of Obstructive Sleep Apnea (OSA) on cognition in older adults. The majority of reviews "supported deficits in attention/vigilance, delayed long-term visual and verbal memory, visuospatial/constructional abilities, and executive function in individuals with OSA." They also found that the effects of OSA on working memory, short-term memory, and global cognitive functioning were somewhat ambiguous, though global cognitive function deficits appeared to be more associated with hypoxemia (low concentrations of oxygen in the blood), rather than simple sleep fragmentation. These professionals urge more intensive research efforts that focus on the severity of th​e OSA, individual patient characteristics, and the choice of neurological measures. This review focused on the subjective measures of cognitive decline in older adults with OSA. Participants with OSA in these studies reported a greater loss of concentration, memory, and executive function deficits relative to the normal population of older adults. Because these studies examined self-reported symptoms rather than objective measures, the researchers suggest that future studies should incorporate validated and norm-references approaches. They also urge the evaluation of CPAP on the symptoms of memory loss and cognitive decline. This pilot study, published by medical professionals at the Mayo Clinic Health System, looked at patients who had a discrepancy between Immediate Memory (IM) and Delayed Memory (DM) scores as measured by a standardized neurological screening tool. The pattern of a lower score on IM relative to DM indicated patients who may be at risk for OSA. The examiners recommended that older adults exhibiting this pattern of scores be routinely examined for OSA, which is treatable and may improve cognitive function. This review, a combined effort among a number of Canadian universities, sought to characterize the cognitive profile of adults with OSA and discussed the role that hypoxemia plays in the cognitive decline of older adults. They found that older adults who have OSA did indeed show deficits in cognitive functioning, but they urged that the severity of OSA may be a factor that needs further exploration. They also suggest that Continuous Positive Airway Pressure (CPAP) treatment may be a positive mitigating factor as well. This most recent study, published as a collaborative effort among professionals in New York and New Jersey for the Alzheimer's Disease Neuroimaging Initiative, examined three groups of patients: those with SDB, those without SDB, and those that have SDB but were receiving CPAP treatment. They found that the SDB group had an earlier onset of approximately five years for Alzheimer's disease and a 10-year earlier onset of mild cognitive impairment (MCI). Additionally, the group being treated with CPAP showed the same results as those who did not have OSA. Thus they hypothesized that CPAP treatment may significantly delay the progression of dementias for people with OSA. Sleep apnea, and the resultant hypoxemia, has a negative effect on memory and cognition. 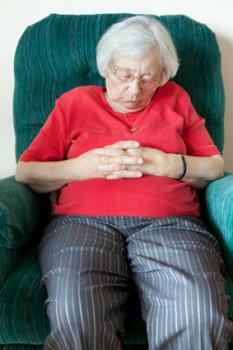 Memory and cognitive problems may have a significantly earlier age of onset due to sleep apnea. Sleep apnea can be clinically silent, and as a result is often undiagnosed in the elderly; consequently physicians should routinely screen for OSA in their older patients. Much more research is needed to determine whether or not CPAP and/or other OSA treatments are effective in mitigating these negative effects. There are a number of questionnaires and tools that professionals may use in order to identify particular kinds of problems with sleep. A simple sleep study could help make an accurate diagnosis so that the problem can be treated effectively. Although CPAP is one of the most widely known and effective treatment options, there are numerous others available as well. Although sleep apnea and cognitive dementia research is still in its infancy, there is ample evidence that untreated sleep apnea could have a profound effect on these disabling conditions. Any concerns about how sleep may be affecting you or your loved ones, particularly if you have noticed a recent cognitive decline, should be discussed with a professional who is knowledgeable about sleep disorders and their consequences.